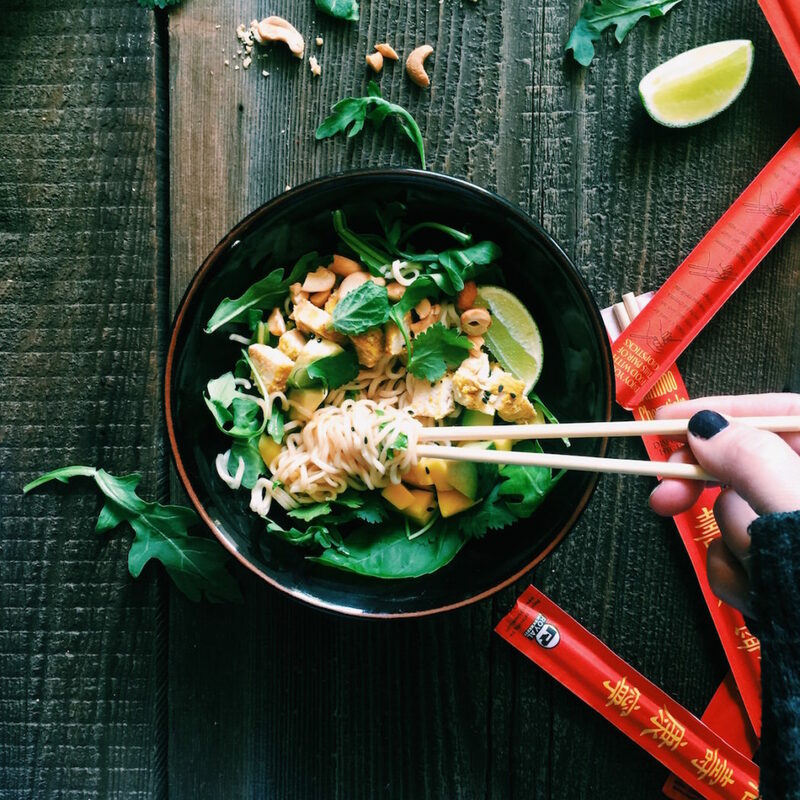 A friend first told me about this Thai noodle salad. She had it at a local-ish restaurant. She showed me iPhone photos and a list of ingredients. You have to try it, she said. Then we went to the actual restaurant to taste the Thai noodle salad. And, yes, it was every bit as good as she said. Completely delicious, in fact. I knew I had to replicate it. Immediately. Since I began work on copying that salad I’ve been back to the restaurant several times, taking photos, grabbing a take-away menu and maybe snuck in a couple glasses of wine while I was at it. I have since made this Thai noodle salad so many times that I couldn’t tell you if it tastes like the original anymore. But I can tell you that I’ve served it to a handful of friends and family members and they were like, who cares if it tastes like the original…it’s delicious. True story. 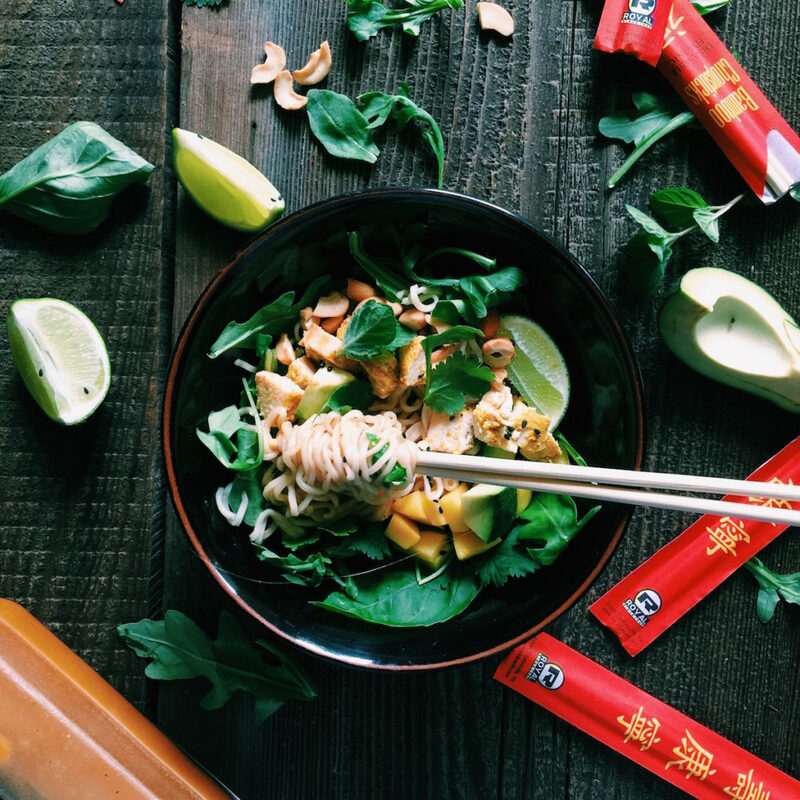 I have a couple of favorite things that I’ve learned about this Thai noodle salad. First, it really is a matter of what vegetables you have on hand and what ones you like. I’ve made it with shaved ribbons of carrots, thinly sliced purple cabbage, thinly sliced napa cabbage, with scrambled egg in there (as Asian noodle dishes tend to have), red peppers, yellow peppers, purple onion…you name it, I’ve shoved it in there. I’m going to give you the core recipe, of what I think should be in there, and then you can amend according to your taste. Slap it around a bit and make it your own. This makes a ton of dressing. Assume you’re going to have leftovers. I really like (need) leftover salad dressing if I’m going to the trouble of making salad dressing. Which really isn’t much trouble…but I think you get the gist. I like to have extra on hand. I mean it with the mix and match veggies…go crazy. At the restaurant they serve this with steak. So good. Every time I made this I made it with leftover chicken. From a rotisserie (yup, I buy them), my own roasted, or that turmeric chicken I made last week. It all worked perfect. I think it would be delicious with shrimp…and also with tofu. I found it worked its way best into my life when it was minimal fuss…so chicken it was. Grab a rotisserie chicken on your way home from work to make your life easy, or hop over to an older recipe that has instructions to quick-roast chicken breasts here. I bought a case of these dressing bottles off of Amazon and I love them. You can totally throw them in the dishwasher and it makes your homemade dressing look beautiful. Appearance isn’t everything, but it helps. Optional: thinly sliced purple cabbage, sesame seeds to sprinkle on top, carrot ribbons (use your veggie peeler to cut long, thin strands of carrot…looks really pretty in the Thai noodle salad), red pepper, mung beans or any other veggie your heart desires. Put all of the dressing ingredients, vinegar through the fish sauce, in a blender and mix until it is fully blended together. Taste. I like the lime kick it has. However, if you’d like to tame it a bit, add 1 tablespoon more of honey. Put the dressing in a glass bottle and throw it in the fridge. Bring a large pot of water to a boil. Set a colander in your sink. Once the water is boiling, throw the ramen noodles in and cook for 3 minutes. Drain the noodles in the colander when done and rinse with cold water to stop the noodles from cooking anymore. Make sure they are 100% cool before adding them to the salad or they will start to wilt the arugula. 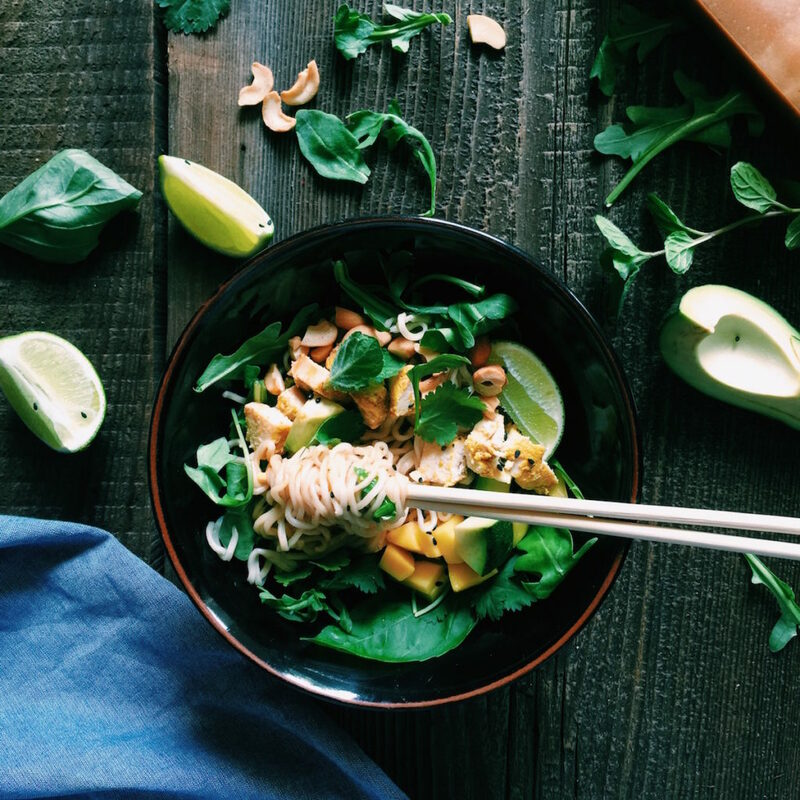 In a large bowl, add your noodles, arugula, cabbage, shredded chicken, mango, avocado and fresh herbs. Put about 1/4 of the salad dressing over the salad and toss. Taste it. Is it just the right amount of dressing? A little more? Follow your taste buds and error on the side of less as you can always add more. Aesthetically, I like to pull out little bits of the salad so you can see pieces of everything you’re going to taste. 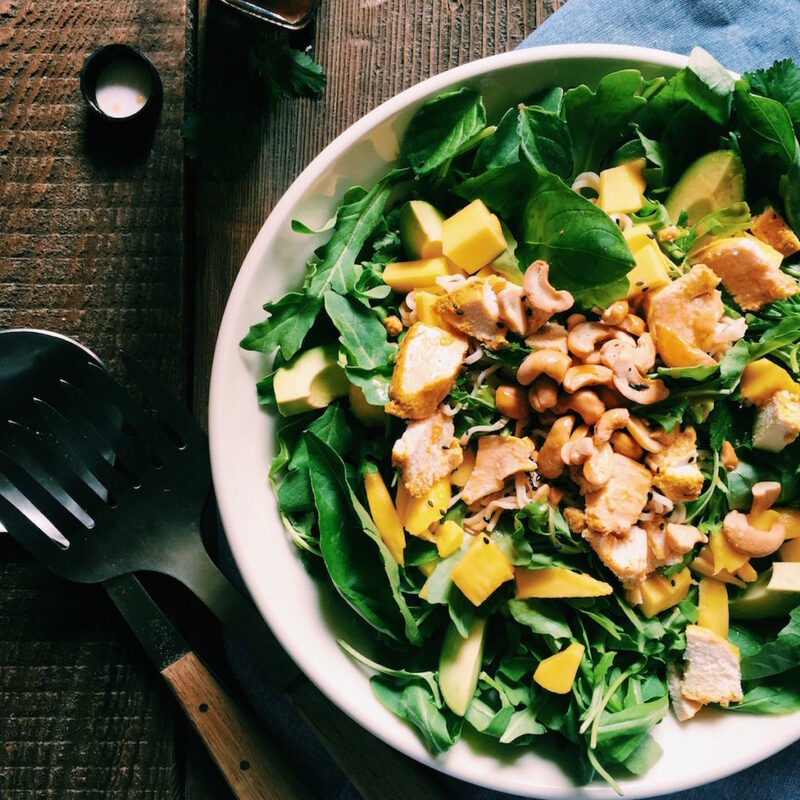 I make sure that there are chunks of chicken, mango and avocado on the top of the salad and peeking out form under the leaves. Finally, sprinkle with the chopped cashews and give the Thai noodle salad one more squeeze of lime (if you’re feeling it) and you’re done. Joy the Baker…please tell me you follow her? Every Sunday she posts the most interesting, random and thought-provoking articles from around the web. The one that caught my eye this morning was Women Need More Sleep Than Men Because Fighting the Patriarchy is Exhausting. I’m still laughing. That article wasn’t what I wanted it to be…but go read all of her recommendations for today’s reading here. This leads me to a book I’ve been reading called All the Single Ladies. It’s a fascinating non-fiction look at the history of single women and how starting in 2009 there were more single adult females than there were married adult females. I found this surprising. The age of a first marriage for women is now in the late twenties. The book talks about the economic, social, political and psychological implications of all of this. I don’t know if I’m positioning it correctly or if it’s just truly relevant to me because I’m a single women, but it’s a riveting page turner. Go check it out. Which leads me to one other thing that has nothing to do with women in the world today…it’s about beautiful, amazing sweets (my most favorite thing). 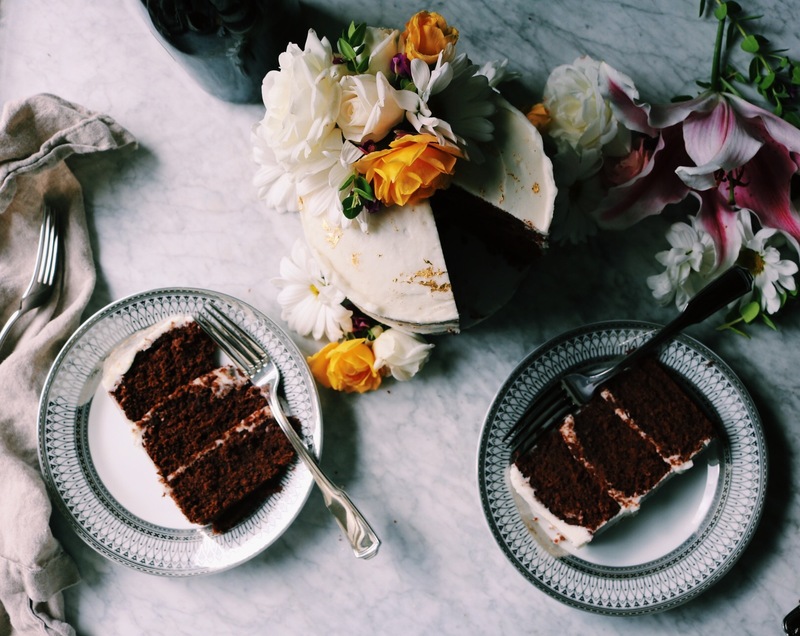 I have a food blog recommendation for you this morning…I’ve been following Tutti Dolce for quite some time. I think I found her when I was putting together my Scone Feed for thefeedfeed. I believe I first ran across some scones of hers? Anyway, go look at her site and follow her on Instagram…you won’t be disappointed. Beautiful photos, beautiful food. I’m thinking since you follow me you like sweets….so, yes, go over to her site without haste. Granola Waffles. Ok, let’s talk about this. First, maybe people have been doing this for years and I’m late to the game…I have no idea. 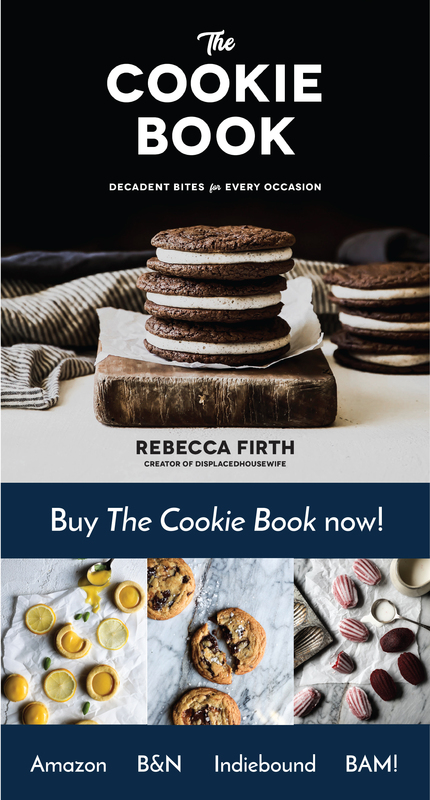 But I saw a recipe for them in the Hot Bread Kitchen (I highly recommend this cookbook if you like to bake bread…everything from pita, tortillas and crusty loaves to, well, granola waffles). I had leftover chai granola from @thejamlab’s recipe and used my waffle recipe. I’d like to a) make an adaption of this chai granola so I could also make it without the chai extract (because that’s not something that’s always around the house) and b) I’d like to create a specific granola waffle recipe. Are you excited about this? It’s happening. Here’s what my first go looked liked. I cannot begin to tell you how delicious this combination is. The granola adds not only delicious flavor to the waffle, but it gives it a light crunch texture that is fab. Seriously. Instagram is changing the way we see photos. They’re putting together an algorithm that will assume what photos we want to see and when. I don’t like this. Not one bit. If this program is as crappy as Facebook’s, it’s the end of the social media world as we know it. And Instagram’s going to hell in a hand basket. Please please please take two seconds and sign the petition to stop this here. I have another recipe up on Huffington Post! Please check it out, comment, like me on Huff Post…is this a shameless self plug? Perhaps. I’m hoping we’re close enough for this. I love Traci’s blog Vanilla and Bean…I wrote about it a week-ish or two ago. She’s been talking lots lately about focusing on organic and non-gmo…go read all about it on her site and you can also read an interesting article on GMO and General Mills here. Recently on DisplacedHousewife: Chocolate Rye Stout Cake + Marshmallow Whiskey Meringue, Tart Cherry Almond Scones, Harissa Sliders with Feta-Harissa Secret Sauce, Brown Butter Muscovado Snickerdoodles, Gluten-Free Chocolate Chip Cookies, Double Chocolate + Banana Granola, Pecan-Crusted Goat Cheese Salad with Blood Orange Tahini Dressing, Braised Datil Chicken with Olives and Oranges, Fluffy Pancakes and Blood Orange Scones. Yes, more salads please: Pecan-Crusted Goat Cheese + Braised Chicken Salad with Blood Orange Tahini Dressing (can sub in oranges for the blood oranges), Honey Sriracha Shrimp Detox Salad, Pomegranate + Burrata Salad, Fresh Fig + Toasted Pecan Salad (can sub in another fruit for the figs), Avocado + Roast Chicken Salad and Bacon Brussels Sprout Slaw. Who knew I had so many salad recipes?!?! This sounds (and looks!) fabulous!!! I love how easy rotisserie chicken makes it too. I think I could eat that dressing all on its very own. Gorgeous, Rebecca! I love the idea of mixing noodles with salad – I don’t do it nearly enough. And the dressing sounds fantastic (and I love having left over dressing – always comes in handy). And thanks for all the links – it’s great to see what other people find interesting. 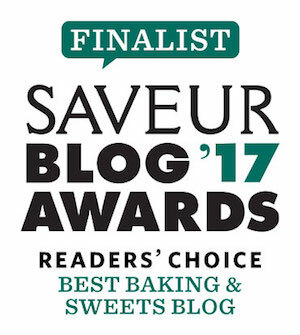 I’ll definitely check out Joy The Baker Sunday round-up. And Traci is sooo informative lately – she’s been opening my eyes to all kinds of issues. I seriously want to eat my weight in this salad and that dressing is killer! LOVE how fresh and vibrant this noodle salad is. Definitely can see myself making the recipe! i love asian noodle-y salads (japanese somen salads is a family favorite, and this recipe reminded me of vietnamese bun cha)! and it screams spring/summer, so i’ll be making this and dreaming of all that produce and warmth and happiness. 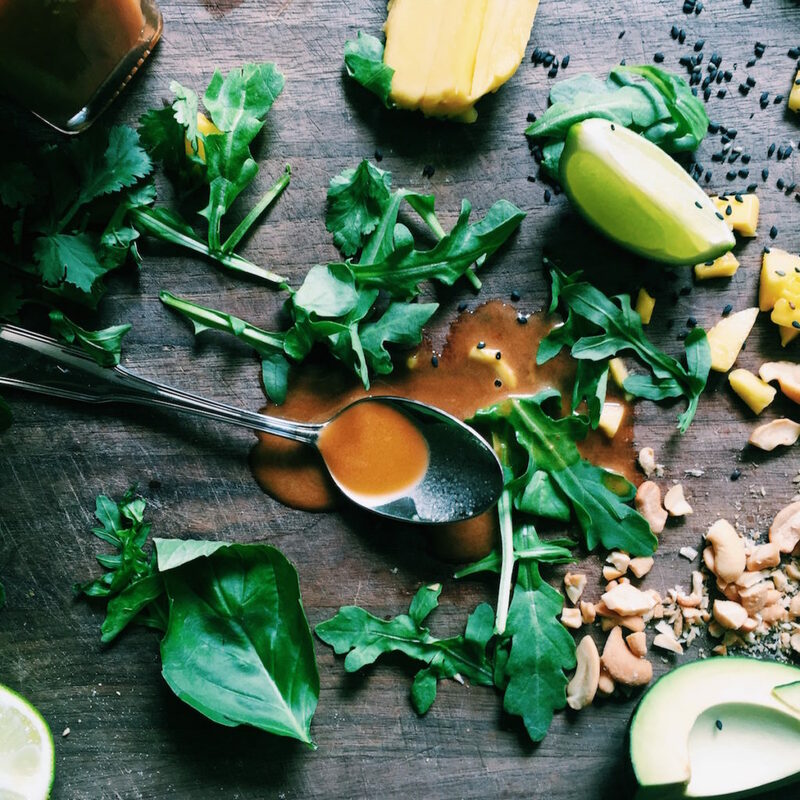 LOVE the salad… YUM+healthy=awesome. Bonus: Love that it makes a ton of dressing… Amen to Joy the Baker and her deeply thought-provoking array of articles every Sunday. Who knew blogger-bakers could be so deep? :) I have to admit I’m scared to go political on my blog… Though at the moment I have SO much to say! (My desire to stay informed is currently at odds with my desire to stay sane… ) WOW indeed on the waffles… gotta get my hands on a copy of Hot Bread Kitchen. Congrats on the HuffPost – that cake should be everywhere! Happy Sunday! loving the versatility in this recipe and want to lick that spoon! all my favorite flavors in that dressing. serious yum. Wow Rebecca, this salad looks gorgeous and sounds wonderful! So loaded full of great ingredients! LOVE, love, love that dressing! Glad it makes a lot. If this is what healthy tastes like, count me in! Enjoy your week! I love the wood in the background, and such beautiful photos. I have to make this today!